There is an old saying from vaudeville, “Never share a stage with kids or animals”. For the weekend photographer, you could almost say the same, but make that photographing kids or animals. Here’s why this is true. The techniques required are almost the same, everyone has high expectations for the results, and the final photograph has probably got less than 40 percent chance of being to the satisfaction of the mother/owner/zoo keeper! Make no mistake about it, photographing animals is not easy. To begin with, let us state that the animals to be captured on film are usually domesticated pets. Photographing man-eating lions in their natural habitat is even more difficult. And dangerous! Use a 2000 mm lens and pray a lot. Now, like photographing anything, the most important factor is the lighting. If you photograph Fido in a dark corner of the room, you will get a gloomy picture of man’s best friend. For your pet to look good, you need good lighting. I suggest that the best places are either outside in the garden, or on a window ledge. With both of these, you are using the lighting supplied by the great lighting technician in the sky, and he is hard to beat. The other important factor in lighting is to turn off your flash. Using flash will only startle the animal and after all your labors you will get only one shot – the first one. The pesky beast will have bolted after the first flash-burst! Here is one of the real secrets of photographing animals – you have to set everything up beforehand. You cannot do it once the star has been brought out into center stage. You have to look through the viewfinder and imagine what Fido would look like in front of that bush, tree, flowerbed or whatever. Dogs and cats have a very short attention span. It is probably best to try and shoot the critter against a fairly bland background and a nice grassy piece of lawn is one of the best. This is particularly so with dogs, as you can shoot down towards the animal and have nothing but green in the background. It is often handy to have a stuffed toy along with you. Putting the toy in position means you can pre-set the focus, check the exposure details and background before bringing Fido out to do his thing. I had the world’s most photographed stuffed tiger as my animal photography assistant. The next part is the hardest. To make this animal portrait appealing, Fido has to appear bright and alert. Since Fido generally spends 95% of his time looking dozy you have already got in behind the 8 ball before you pop the shutter. The owner will want the alert dog picture and you will have to produce it. With dogs, the trick here is a box of matches. Just before you take the shot, rattle the match box in your hand. Fido will look up, ears will be erect and you get that shot! With cats it is even more difficult. 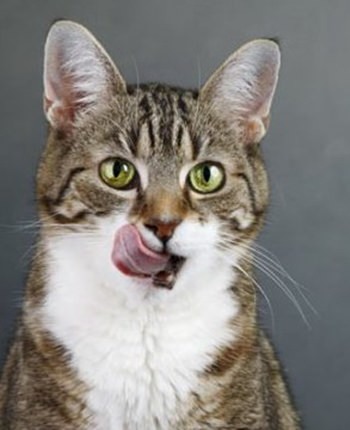 The classic shot is cat licking lips. This can be engineered, by wiping a little bacon fat on the cat’s mouth and moving quickly. You have around three seconds to get the photograph before the cat wanders off and does its independent cat thing. Probably the easiest to photograph are pet frogs, but even these look better if you sprinkle some water on them first. Birds? Hit and miss, just take plenty of shots.